California Turkish Angora Rescue View other Turkish Angoras for adoption. ***Sorry, we cannot adopt outside the Southern California area*** Meet Milo! 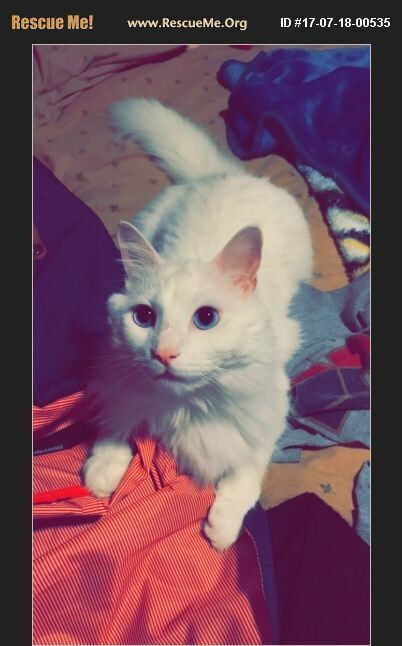 He is a beautiful, white Turkish Angora with beautiful blue eyes. He is deaf. He was born 6/2015. He is very sweet and affectionate. He absolutely loves human interaction and is very loving. he is the definition of a lap kitty. Milo is looking forward to his new loving, forever home. Milo would be best suited as a solo kitty.